Pack of (5) – 3.0 Cu. Ft. 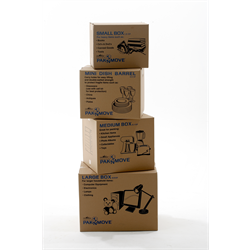 Medium Pak-N-Move Cartons are the ideal boxes for moving clothes, platters, bulky items, also great for storing large household items such as collectibles, holiday ornaments, table lamps, and electronic equipment. 3.0 Cubic Foot, Size: 18x18x16h, 32 ECT.